The dilemma of raising a “vegie kid”….. I last ate meat 2 years ago, and to be honest, it is a change that I wish I had made earlier. My husband and I committed to a meat free diet together and have both experienced significant positive health outcomes as a result. But now with the impending birth of our first child (10 days to go and counting, eeek! ), we are faced with the dilemma of whether to raise our children as ‘vegie kids’. This may be a no brainer for some people, if you’re a ‘vegie’, then why wouldn’t you bring your kids up as ‘vegies’? Hmmmm, well as a relative newby to the meat free world, but also someone who believes exposure to the world in it’s widest perspective is the best thing you could do for another human in your care – I reckon it is a pretty significant decision that requires some consideration. I should clarify that our diet includes dairy, eggs and seafood – and the reason for this is that I truly believe we are following a diet that is will help us achieve an optimal level of health and that will minimise our risk of chronic disease so we can live for ages and ages. We all want to live a long, healthy life right? I’d LOVE to live well past 100 yrs old if I can! It is my belief that a largely plant based diet with small amounts of dairy and seafood is the way to go. It seems to me that the evidence continues to mount – a diet that is rich in plant based food is the way to minimise your risk of chronic illness. The work of people like Colin T Campbell and Caldwell Esselstyn is the foundation of this argument, and whilst they advocate a completely vegan diet for optimal health, the notion that our diets should be largely based around plant foods, with minimal animal products (in particular red and processed meat products) is one I subscribe to. For anyone who doubts the science behind this, I encourage you to read The China Study and start to take notice of the messages we are seeing all over the world regarding plant based foods and their role in health. There is a lot of talk about the The Mediterranean Diet at the moment, and this is another example of a largely plant based diet that has been researched and proven to be beneficial in both the treatment and prevention of illness’ such as heart disease, cancer and diabetes. And this is not yet to mention the current obesity epidemic sweeping the world and the role that animal products may play in this, especially for our kids who are becoming more overweight at an earlier age. So why the dilemma in whether to bring up “Zeus” as a vegie? Well, I grew up eating meat, and as a Nutritionist I understand the role that meat products can play in a healthy diet, especially one of little growing bodies in need of complete protein, iron, zinc and an abundance of vitamins and minerals to grow healthy and strong. Consuming meat is certainly an efficient way of getting these nutrients, however I am personally convinced that the longer term benefits of a meat free diet far outweighs any short term ‘convenience’ factor that consuming meat can offer. Then there is of course the cultural aspect – we are in living in Australia – a place where some people may argue it is ‘un-Australian’ to be a vegie. Fairly so too, Aussies love to BBQ, roast, spit and marinade like no others around the globe, and we pride ourselves on our ability to cook a mean steak! “S rolls” at kid’s birthday parties, school sausage sizzles, a pie at the footy, a sausage at Bunnings on a Saturday morning – sound familiar? I think we are going to see a shift away from diets that are heavily reliant on animal products, maybe even before Zeus hits school. But I see this change playing out very slowly, particularly in Australia, where there would also need to be significant cultural change along the way. We are one of the largest meat eating societies in the world – meat and animal products not only make up a huge part of our food culture but are engrained in our social fabric. I mean, is it ok to be the ‘vegie kid’ at school? And if not, when will it be? 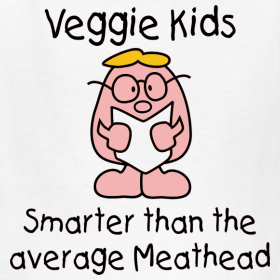 Can’t say I remember many vegetarian kids at school when I was growing up….come to think of it…..I can’t remember a single one. The real question here is about freedom of choice. I guess you could see subscribing your child to a meat free diet analagous to bringing them up in a certain religion – you are making that choice for them before they have the luxury of choice themselves. So do we choose to raise Zeus in a meat free household because we believe it is the most healthful way to eat? Or do we expose Zeus to the widest variety of foods possible, until he is old enough to make his own decision? Lucky we have a few months to figure this one out, it ain’t a decision to be taken lightly. This entry was tagged animal products, kids, meat free diet, vegetarian, vegiekids. Bookmark the permalink. I have always wondered about raising children vegetarian – great post.